Looking for a safe tile and grout cleaner in Hoover, AL? If yes, then you have come to the right place! If you have kids and pets around, safe cleaning products are very important. Strong chemicals that need to remain on our surfaces for a little while during the cleaning process is not practical for those who have to look out for our little friends that are so busy and on the go. That is why I’ve put together this little combination from some information we’ve found to be helpful in the past. To make this cleaner, mix about 2 cups of vinegar with half a cup of baking soda. It is best to mix these in a plastic bucket. The solution may become warm when you use it. It will also smell like vinegar. It is a good idea to wear gloves while you are scrubbing the tile and grout. Then take a brush, and rub it on your tile grout lines. For best results, you want to allow it to dry. And then come back and scrub it one more time. If you are still struggling with the cleaning of your tile and grout or maybe you just don’t have the time it takes to get the job done; give us a call at Heaven’s Best Carpet Cleaning. 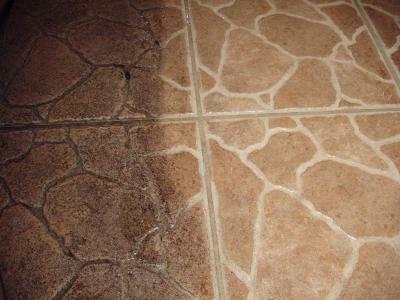 Over time, mold, mildew and dirt take residence in the porous surfaces of your tile, stone & grout. Our cleaning solution penetrates deep inside these pores removing bacteria and other micro-organisms. For a safe tile and grout cleaner in Hoover, AL, give us a call today at 205-618-9150 and we’ll be happy to give you a free estimate to get the job done well and right away!